Spirit Fiddle, featuring Champion Fiddler Robin Warren and Guitarist Brian Clancey, performs a wide variety of energetic music, ranging from bouncy Southern and Texas swing tunes to sweet waltzes, old popular songs, bluegrass numbers, French Canadian and Celtic jigs and reels, and Parisian musette. From The Boston Museum of Fine Arts to the renowned Fiddler's Grove Festival in Union Grove, North Carolina, from the syrup festival in Henderson, Texas, to the oldest bluegrass festival in Canada, from sidewalk cafes to coffee houses and formal concerts, audiences delight in the eclectic mix of music Spirit Fiddle performs, and in their natural sense of humor on stage. Since its first appearance over 15 years ago, Spirit Fiddle has given 1000s of performances and recorded 7 full-length albums. We recently released our 7th album, entitled Tribute, dedicated to the parents who made music such an important part of our lives. Check out our schedule, and come see us in person! We recently released our 7th album, entitled Tribute. Previous titles include Crossing Borders, Rapproche - Come Closer, New Old Fashioned, Cafe Music, Blue Jeans and Gingham, and Mother's Day Waltz. Read about all of our CDs, and listen to sound samples. Order CDs online - they make great gifts! After studying classical violin as a child, and giving solo violin recitals in Boston's Brown Hall and the Isabella Stewart Gardner Museum, Master Fiddler Robin Warren took first place prizes in numerous fiddle contests in North Carolina and New England. She was the first fiddler ever to win the coveted Fiddler of the Festival title during 3 different years at Fiddler's Grove in North Carolina. For this, she was granted the title of Master Fiddler. 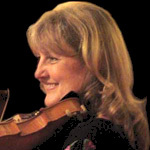 She is also one of several fiddlers featured in the 1994 PBS Special entitled Fiddler's Grove, a Celebration of Old-Time Music. She has appeared on over 2 dozen albums and collections. 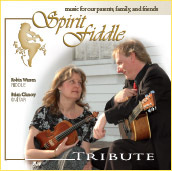 Brian Clancey brings a lifetime of experience (from Renaissance lute to bluegrass) to his sensitive guitar arrangements of Spirit Fiddle tunes. Drawing on musical experience that crosses boundaries of time and style, he is able to create an authentic setting for each Spirit Fiddle tune. 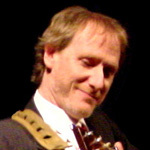 Brian is known throughout the Boston area as an outstanding rhythm player, and he is a popular backup guitar player at contests and festivals throughout New England.